Unfold the pastry sheet on a lightly floured surface. Roll the pastry sheet into a 12-inch square. Cut into 24 (3x2-inch) rectangles. Place the pastry rectangles onto a baking sheet. Brush with the egg mixture. Bake for 10 minutes or until the pastries are golden brown. Remove the pastries from the baking sheet and let cool on a wire rack for 10 minutes. Split the pastries into 2 layers, making 48 in all. Stir the Gorgonzola cheese, cream cheese, walnuts, tomatoes and parsley in a medium bowl with a fork. Season with the black pepper. 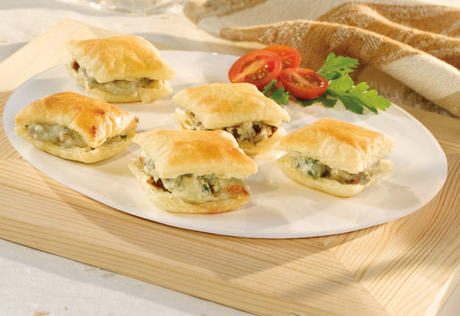 Spread 1 tablespoon cheese mixture onto 24 bottom pastry layers and top with the top pastry layers.